For other meanings, see Balochistan (disambiguation). Balochistan (Urdu: بلوچستان‎) is a province in Pakistan. The capital of Balochistan is Quetta. 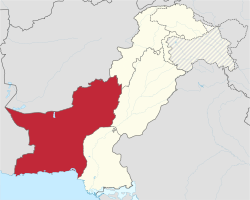 Balochistan has a population of about 10 million people and an area of 134,051 mi2 or (347,190 km2). It covers 45% of Pakistani territory; in terms of area the province of Balochistan is greater in area than Republic of the Congo but smaller than Germany. On the 30th of June in 1947 the Khan of Kalat joined Pakistan; tribal gathering and municipality of Quetta declared for Pakistan. Some leaders preferred independence from Pakistan. The Baloch people once referred to their land as Moka or Maka, a word which later became Makran. Moka might have been an adaptation of Mahi-khoran, Persian for "fish eaters", an appellation used by the Persians of the west for the people of coastal Balochistan. Arrian, in his Anabasis Alexandri, referred to the people of the region as the ichythophagi, a Greek translation of Mahi-khoran. Balochistan is referred to in Pashto as Gwadar or Godar (also Godar-khwa, i.e., the land by water). The Greeks, who derived the names of Iranian lands from the Bactrian language, Hellenised it to Gedrosia. In an eleventh-century Sanskrit compilation of Jataka tales (Avadānakalpalatā) by Kshemendra of Kashmir, the land is called Baloksh (बलोक्ष). From Baloksh, the name evolved and was Persianised to Balochistan. The area is named after the numerous Baloch (or Baluch, Balouch, Balooch, Balush, Balosh, Baloosh, Baloush) tribes, an Iranian people, who moved into the area from the west around 1000 A.D. All natives are considered Balochi even if they do not speak Balochi; Pashto, Persian, and Brahui languages are also spoken in the region. 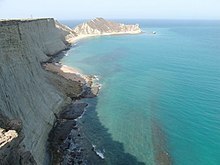 The southern part of Balochistan is known as Makran. There are also relatively smaller communities of Iranian Baloch, Hazaras, Sindhis and other settlers, including Punjabis, Uzbeks, and Turkmens. The name Balochistan means "the land of the Baloch" in many regional languages. Balochistan is situated in the south-west of Pakistan and covers an area of 347,190 square kilometres (134,050 sq mi). It is Pakistan's largest province by area constituting 44% of Pakistan's total land mass. The province is bordered by Afghanistan to the north and north-west, Iran to the south-west, Punjab and Sindh, and Khyber Pakhtunkhwa and the Federally Administered Tribal Areas to the north-east. To the south lies the Arabian Sea. Balochistan is located on the south-eastern part of the Iranian plateau. It borders the geopolitical regions of the Greater Middle East and Southwest Asia, Central Asia and South-central Asia. Balochistan lies at the mouth of the Strait of Hormuz and provides the shortest route from seaports to Central Asia. Its geographical location has placed the otherwise desolate region in the scopes of competing global interests like Afghanistan for all of recorded history. The capital city Quetta is located in a densely populated portion of the Sulaiman Mountains in the north-east of the province. It is situated in a river valley near the Bolan Pass which has been used as the route of choice from the coast to Central Asia, entering through Afghanistan's Kandahar region. The British and other historic empires have crossed the region to invade Afghanistan by this route. Balochistan is rich in exhaustible and renewable resources; it is the second major supplier of natural gas in Pakistan. The province's renewable and human resource potential has not been systematically measured nor exploited due to pressures from within and without Pakistan. Local inhabitants have chosen to live in towns and have relied on sustainable water sources for thousands of years. This page was last changed on 21 March 2019, at 14:55.